Whining can truly make you want to pull your hair out. 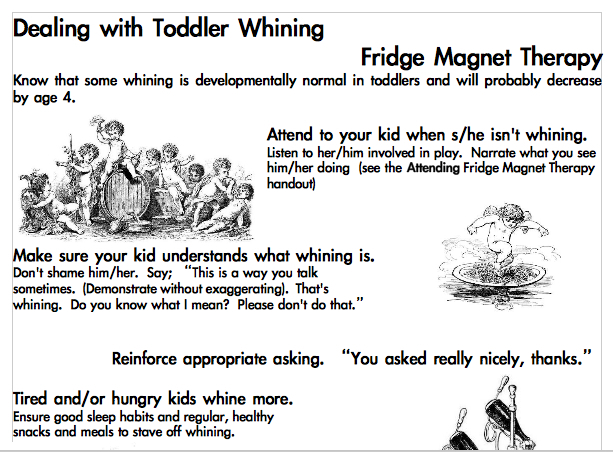 Here is another in the Fridge Magnet Therapy series of printables all about how to deal with toddler whining, a suggestion from reader and friend of the site Ms. T. I hope it proves helpful. Your feedback is always appreciated. Illustrations are from project Gutenberg's "A History of Champagne, with notes on the other sparkling wines of France" 1882 by Henry Vizetelly (chevalier of the order of Franz-Josef, no less. No note about whether chevalier Vizetelly illustrated the work himself or not.) I included an additional one (right) that didn't make it into the printable. Is he wondering if a drink might help him be patient with the whining at home?